Mexico's most wanted drug lord, Joaquin "El Chapo" Guzman, stands for his prison mug shot with the inmate number 3870 at the Altiplano maximum security federal prison in Almoloya, Mexico, Jan. 8, 2016. 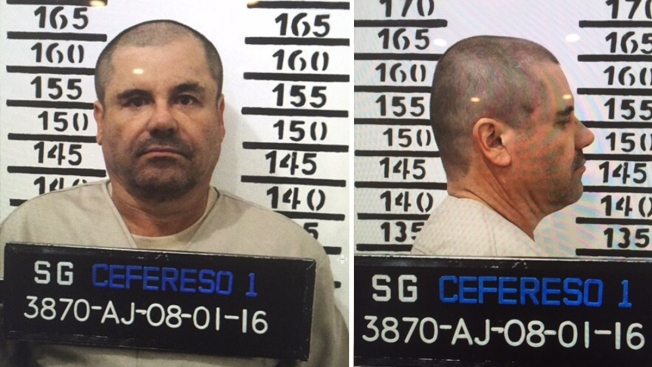 Lawyers for drug lord Joaquin "El Chapo" Guzman said Friday he told them that guards at Mexico's Altiplano prison won't let him sleep, and that plans to make a movie about his life with actress Kate del Castillo are still on. Guzman's lawyer, Jose Refugio Rodriguez, said drug lord still wants the movie to be made but that the accused drug lord won't contribute money to it. "He wants it to be done," Rodriguez said, adding that Guzman's belief is that Del Castillo is still in charge of the project. Del Castillo has not commented directly on whether the movie plans are still on. "I know that Kate is Mr. Joaquin Guzman's representative ... she is authorized to do it," he said. "And he told me Monday that the movie has to go forward." Rodriguez said Guzman's involvement would be to authorize the use of his name and story. At an impromptu news conference outside the prison west of Mexico City, another of Guzman's lawyer said guards waken Guzman every two hours at night, and the practice is equivalent to torture. "He said 'what I want is for them to let me sleep. They are making me into a Zombie," Juan Pablo Badillo quoted Guzman as saying. Badillo compared Guzman's treatment to that of prisoners at the U.S. detention center at Guantanamo Bay, Cuba. "This is the same torture they applied to prisoners of war there in Guantanamo," he said. Rodriguez gave The Associated Press a copy of Guzman's testimony in one of the cases against him, in which the jailed drug lord accuses prison authorities of torturing him and said "I feel like a sleepwalker," saying the practices had affected his health. But the testimony also sheds light on the relatively permissive visitors' schedule Guzman enjoyed at the maximum-security prison before his escape in July. It has been reduced since he was recaptured in January. Guzman said he had been give an hour-and-a-half every day to talk to his lawyer, an hour in the sun in a prison patio, and a four-hour conjugal visit and a four-hour family visit every nine days. That regimen of visits — few of which would occur in a U.S. top-security prison — may explain why Guzman's lawyers are working so hard to prevent his extradition. Badillo said that lawyers had filed a total of nine constitutional appeals on Guzman's behalf against extradition, restrictions on visits and other alleged violations.